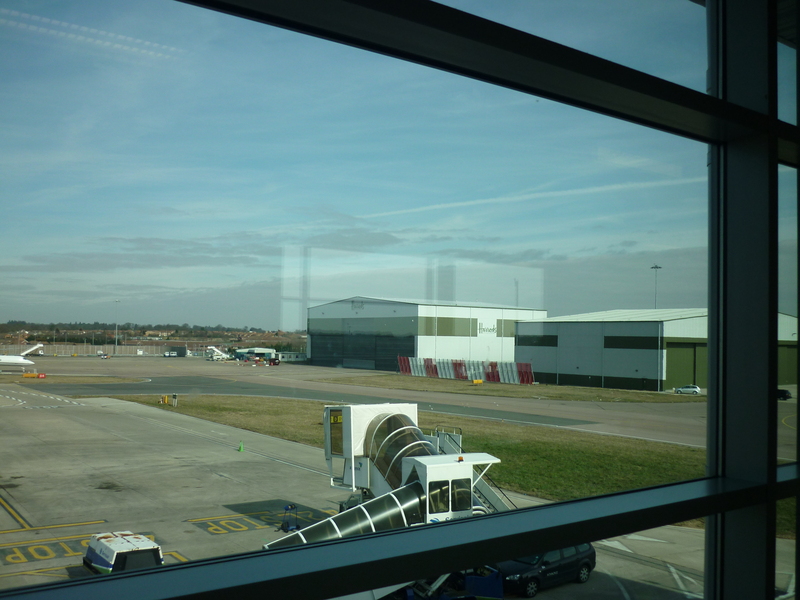 Whilst waiting to catch my flight, I caught sight of the Harrods logo on of the aircraft hangers outside the window at Luton airport. Interesting, I didn’t know Mr Alfayed or the world famous department store would have any interest in the aviation business. Luton being a city north west of London has a busy medium volume of flights to various bits of Europe as well as domestic parts of the UK including Scotland and the Channel Islands. Flying with Easyjet was ok. The flight itself wasnt particulary cheap as it was only slightly cheaper than my flight with BMI last year, and the next cheapest would of been with Turkish airlines and had to spend a good few hours changing planes in Istanbul. Bearing in mind as a budget airline you dont get food, drinks, TV/movies, choice of seat etc, this is no big deal when flying to Paris or Amsterdam as its only 1 hour and 15 minutes for these sorts of routes, however here being 4 hours, it gets annoying paying for #4 for a very small cake and some coffee. I brought some food to take on the plane however when I was about to say goodbye to my parents, the announcement on the tannoy system was you were strictly allowed on bag to carry on, so I gave part of my lunch to my parents, and just carried my laptop with me and two large books loose. When getting on the plane I noticed overhead luggage space was very tight, it seems most of the other passengers took no notice of the announcement, mostly a necessity with people needing things for very young children and religious Jews who always carry boxes to put their hats in, as well as many people with laptops meant shoving your belongings wherever they could fit often some distance away from your seat. 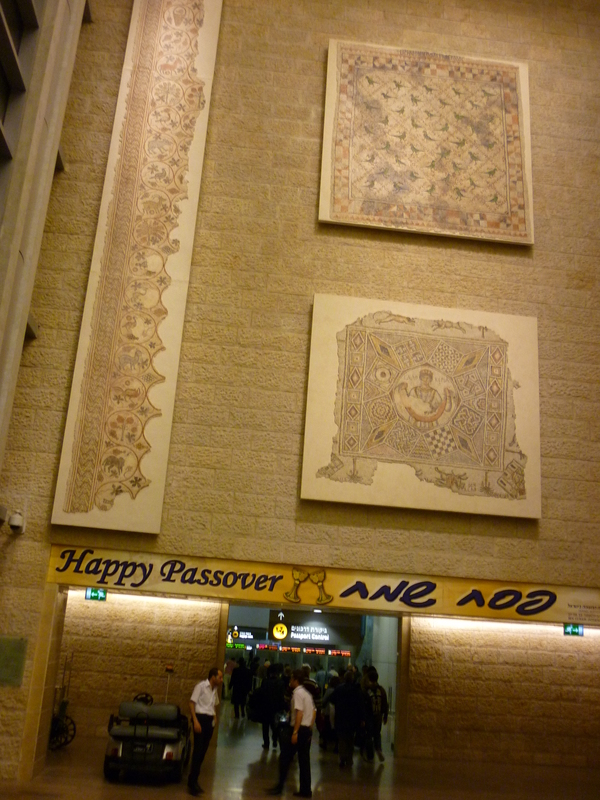 Tel Aviv Ben Gurion airport has this nice Roman Mosaic hung on the wall of the new airport that was built in 2004. Some people have said TLV is one of the best airports in the world, with its modern bright interior with familiar white Jerusalem stone everywhere, big water fountain at the interest, free (unlike Heathrow) wireless internet and big choice of shops I am inclined to agree here. The next step was getting on a Sherut bus (12 seater Mercedes van) directly to my new flat. This was quite simple and I do like this cheap and easy direct to your door method, with the exception of driving very fast in between some road humps around the discrict of Talpyiot which made me feel a bit sick. Anyway its nice to be back, in a much nicer apartment and in a different part of town.